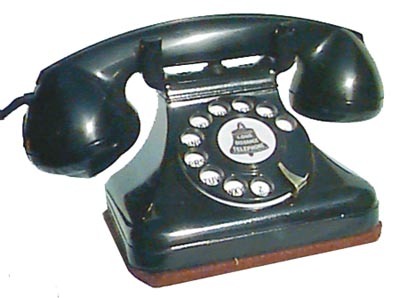 Leich: A bakelite design during the Art Deco era originally having a handset, which paralleled the style of Kellogg, W.E., and Stromberg Carlson. This phone was used also on top of a larger curved bakelite magneto housing to serve rural areas. Since crankers are no longer very practical for signaling, these top parts can be removed from the magneto housing and with dial installed and decorative yet today. Leich began as Eureka in the late 1800’s in St. Louis & Chicago, then became in around 1902 Cracraft Leich [after its founders] and later Leich [Cracraft departed]. Its home for many years was Genoa, Illinois. In the 1950’s they were absorbed by Automatic Electric Company, who continued with the same product until stock was depleted. This phone was made from about 1930 or 1932 until the late 1940’s.